Your mileage may vary on inside-track Hollywood comedies. Among the greats, there are biting satires like The Player or Swimming With Sharks and broader, sillier works like Tropic Thunder or Bowfinger, but the kind of rarefied air in which they largely unfold can sometimes be suffocating. 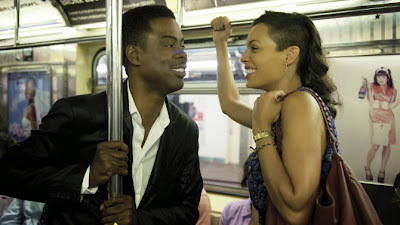 Thankfully, that's not the case with Top Five, Chris Rock's first project as a writer-director since 2007's I Think I Love My Wife, and inarguably his best so far. Andre Allen is a stand-up comedian turned movie star. To promote his latest film Uprize, a widely maligned film in which Allen plays Haitian revolutionary Dutty Boukman, Andre agrees to be interviewed by New York Times reporter Chelsea Brown, despite having endured the slings and arrows of her newspaper's film critic for years. As Chelsea gently probes for something she can build into a more substantial profile, Andre has to come to terms with himself and his public image.